What you’re about to see will bring tears to your eyes. 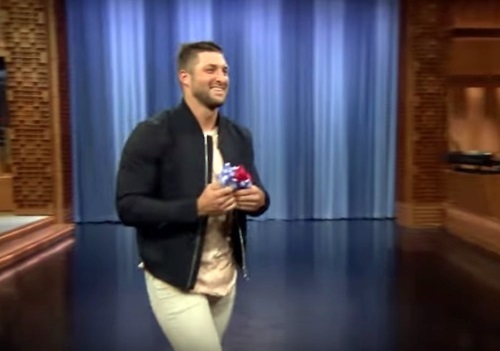 Tim Tebow used his time on The Tonight Show with Jimmy Fallon to make a positive impression on a young person and prove to the world that he cares. Judy Adams, a high school student, who would have admitted that she had a crush on Tim Tebow, would have never thought her crush would come to life one day before her prom. Tim Tebow cares about giving back to the community. As a star football and baseball player, he started the Night to Shine organization, which is a nonprofit that does exactly what it says in its name. It gives young people their chance to shine and become the best person they can be. Although Judy would claim that Tim Tebow is her inspiration, he’d turn the phrase right back on her and claim that she and others like her inspire him to do what he does. While on the Tonight Show with Jimmy Fallon, Tebow explained how Judy asked him to be her date to the Night to Shine event. This event is a worldwide prom for high school-aged students who also have special needs. On the night of the event, Tebow rolls out the red carpet and gives these students, who far too often feel left out and different, a chance to enjoy themselves and have the time of their lives. 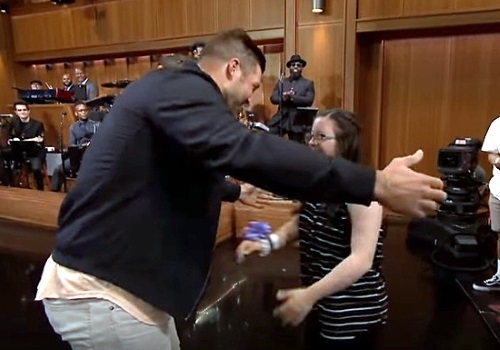 Although Tebow had to let Judy down because he could not attend the event, he does do something for her that day in the audience of the Tonight Show that Judy Adams will never forget. “She is so amazing and so inspirational, and she is here!” Tebow said. The professional sports star then asked Judy to step out of the crowd and onto the stage with him. That’s when he asks Judy to perform a slow dance with him, making it a night that he hopes she’ll remember for a long time. Then in front of the national audience, Tebow led Judy in a slow dance that is not only sweet but a reminder to all the people his foundation helps. Viewers of The Tonight Show shared their reactions in the comments of the video. Here are just a few. What do you think about Tim Tebow’s Night to Shine event, a worldwide prom for those with special needs?